In this way the new platform, developed by a team led by scientists at the U.S. Department of Energy's Lawrence Berkeley National Laboratory (Berkeley Lab), could potentially be used to inactivate or detect pathogens. The team, which also included researchers from New York University, created the synthesized nanosheets at Berkeley Lab's Molecular Foundry, a nanoscale science center, out of self-assembling, bio-inspired polymers known as peptoids. The study was published earlier this month in the journal ACS Nano. 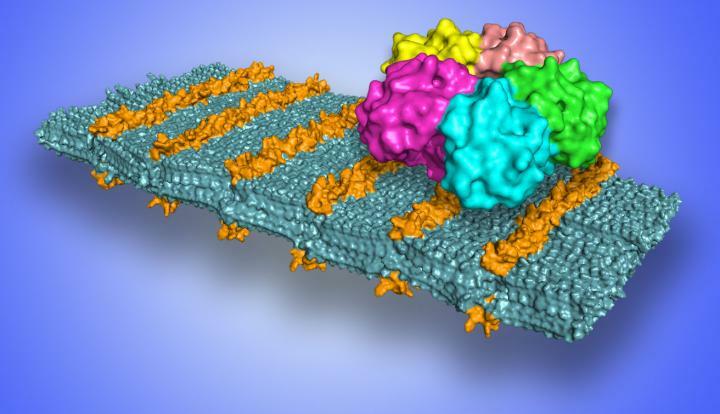 "It's not just a 'lock and key' – it's like Velcro, with a bunch of little loops that converge on the target protein together," said Ronald Zuckermann, a scientist at the Molecular Foundry who led the study. "Now we can mimic a nanoscale feature that is ubiquitous in biology." "The chemistry we're doing is very modular," Zuckermann added. "We can 'click on' different sugars, and present them on a well-defined, planar surface. We can control how far apart they are from each other. We can do this with pretty much any sugar." "The chemical information that instructs the molecules to spontaneously assemble into the sugar-coated sheets is programmed into each molecule during its synthesis," Zuckermann said. "This work demonstrates our ability to readily engineer sophisticated biomimetic nanostructures by direct control of the polymer sequence." Scientists also conducted X-ray-based experiments at Berkeley Lab's Advanced Light Source to analyze the nanoscale structure of the sheets, and confirm the presence of sugars on their surface. The Molecular Foundry and Advanced Light Source are DOE Office of Science User Facilities. This work was supported by the U.S. Defense Threat Reduction Agency, the U.S. Defense Advanced Research Projects Agency, and the National Research Foundation of Korea.